Correction! Today was a great day! Actually yesterday was a great day. When I saw this week’s topic for the Photo Challenge, I thought, huh. How do I convey a good day? And then yesterday happened! And it demonstrated several things to me. First, what constitutes a good day for me. Second, what a wonderful place I live. Third, just how lucky I am to have a camera and a desire to shoot photographs and maybe a little talent. First of all it was a clear day in the midst of weeks of forest fire smoke, not only from fires around here but fires from Washington state. We have had air quality advisories for days. But yesterday was clear, bright and inviting. 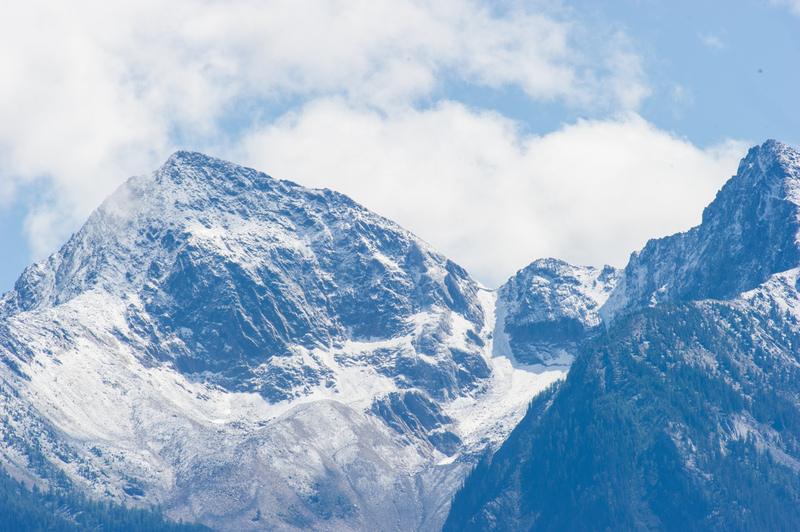 And, surprisingly after days of heat, we had the first snow on the mountains! We headed up to the grocery store, about 10km north of here, passing along the lake. And I spotted some birds way out on the water. Specks. But pulled over and grabbed my camera with a 200-400mm lens. A ton of equipment weight wise. 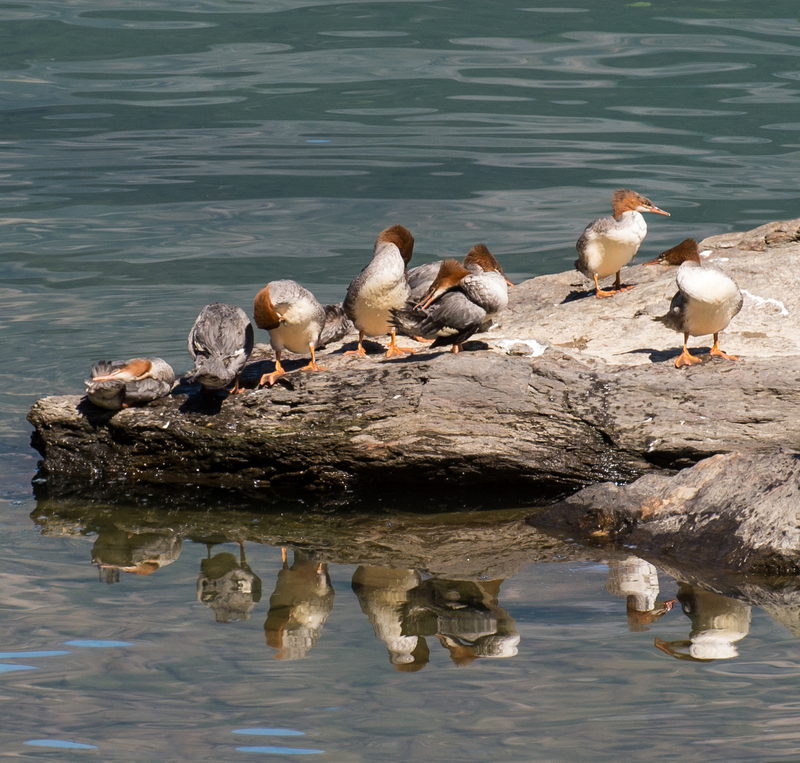 I started taking photos of a group of mergansers coming into shore, maybe. Then on the way home, I spotted a kestrel and a baby kestrel, a little far away, but…And an adult on the hunt. Then crossing the creek I spotted a deer and caught a doe and one of her fawns. And then I heard a splash and turned around to see a muskrat coming down the stream. And along the shore again, I spotted one loon which turned into four. They were trickier to photograph as they decided to stay far enough apart that I couldn’t really crop the shots too much. They disappeared one at a time. I kid you not! That was all in one day. That is what I call a great day, not just a good day! Just a reminder, all my photographs are under copyright and cannot be used without my permission. a beautiful day indeed! congratulations on seeing so much wildlife!! Even I was impressed and I know how much wildlife there is here! Isn’t it grand! Thankfully it seems this happens fairly often. Thank you for your comment! 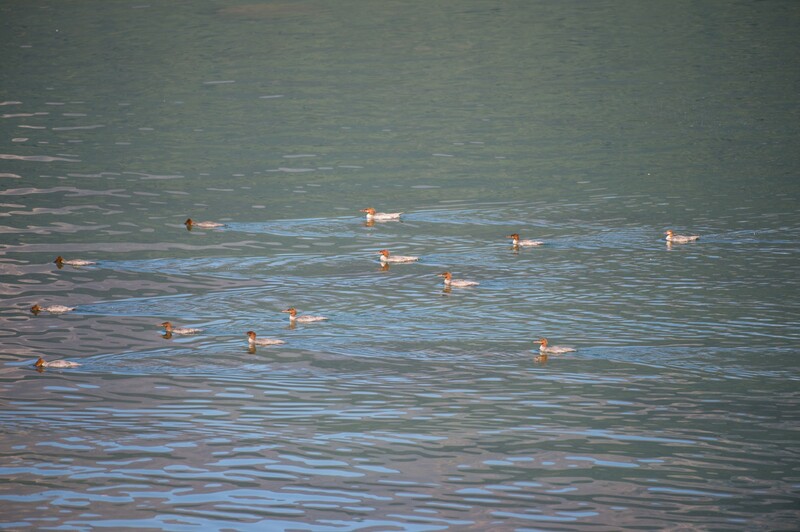 That’s a lotta Mergansers. Sometimes when the lakes are frozen I’ll see a flock of…6 or 8 in our channel, the only open water patch for miles around. We had one family with 13 young, this group. And another smaller family. This year was a lot of fun.